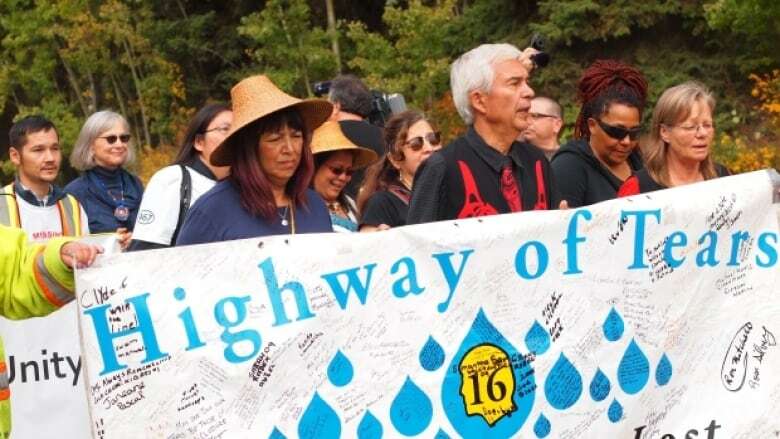 Twenty-eight people are walking along Highway 16, also known as the Highway of Tears, from Prince Rupert to Smithers, B.C. They're set to meet with the National Inquiry into Missing and Murdered Indigenous Women and Girls. Gladys Radek has barely slept in three days. She's also walked over 100 kilometres. But speaking through a fuzzy cellphone connection from a gas station along Highway 16 in northern B.C., Radek's voice bursts with energy. "We do this because we care, we do this because we want our family members to know that we're not alone," she says. 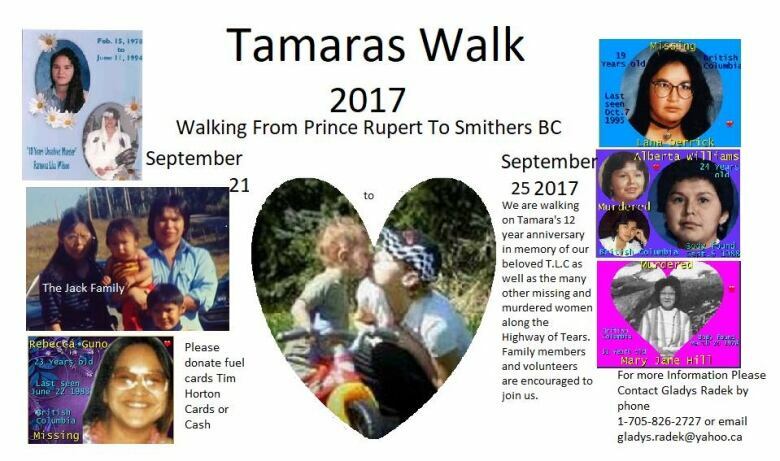 Radek is the organizer of Tamara's Walk, a five-day annual walk in northwestern B.C., from Prince Rupert to Smithers. 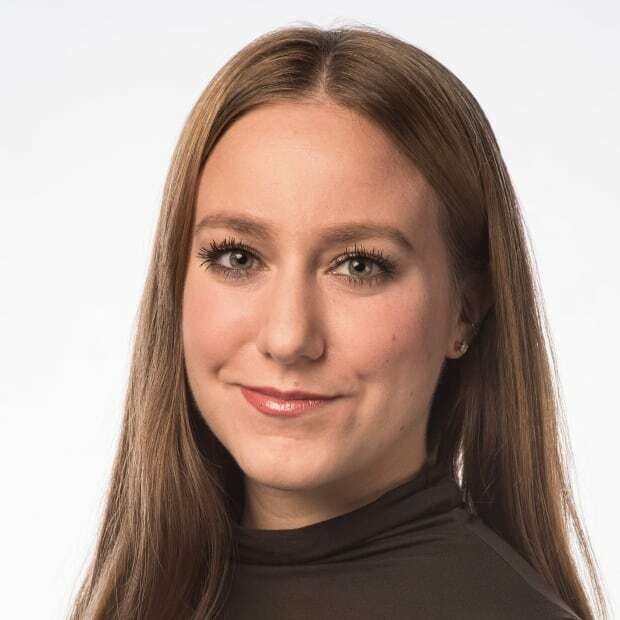 The trek along the Highway 16 corridor — also known as the Highway of Tears — commemorates the disappearance of her niece Tamara Lynn Chipman. Chipman disappeared from Prince Rupert on Sept. 21, 2005, at the age of 22, leaving behind a young son. This year, 28 walkers are making the trek. "It is a very emotional experience. We have some of our walkers that are also breaking down because the emotional and spiritual end is really tough," said Radek. "We know that our women and girls are out there, probably in those rivers and those culverts that we're walking by, and in the mountains." The RCMP have acknowledged that 18 girls and women have gone missing or been murdered along the stretch of highway between Prince George and Prince Rupert and nearby routes since 1969. Indigenous leaders say that number is closer to 50. When the group members end their walk in Smithers, they'll proceed into town alongside three commissioners from the National Inquiry into Missing and Murdered Indigenous Women and Girls — including Chief Commissioner Marion Buller. The next day, community hearings for the commission are scheduled to take place at the Dze L K'ant Friendship Centre in Smithers. PODCAST | Missing & Murdered: Who killed Alberta Williams? This is Radek's seventh year organizing the event. She walks alongside her car, affectionately known to walkers as the "War Pony." "It is total chaos every morning, it's just dealing with 28 different personalities, and everyone needs to eat," she said. "But we have one common bond at the end of the day because we all love our missing loved ones, and this is worth it for them." Though the walk is named for Tamara, many participants have their own stories of loss along the highway. The route is marked with places heavy with significance. On their first day, they stopped for lunch at the site where Alberta Williams was murdered in 1989. Radek's cousin Lana Derrick also went missing from Prince Rupert, while visiting her mother over 20 years ago. Radek said she asked the inquiry's commissioners to walk into Smithers with her so that she can tell the families' stories herself. "We need to figure out not only how we can get answers and why this happened — we also need to know what we can do to prevent it," she said. The inquiry into murdered and missing Indigenous women and girls has been plagued with problems. In August, dozens of family members, activists and academics wrote an open letter to Prime Minister Justin Trudeau demanding the "deeply misguided" inquiry get a hard reset. But as Radek walks along a chilly stretch of Highway 16, she remains focused on her goal. "I just want to say to all the families that all of you are valuable to us and all the walkers have all the families in their hearts and in their minds."